The other week, I got into a fairly intense discussion with my hairdresser about euthanasia and the NHS ( he's quite an intense hairdresser). 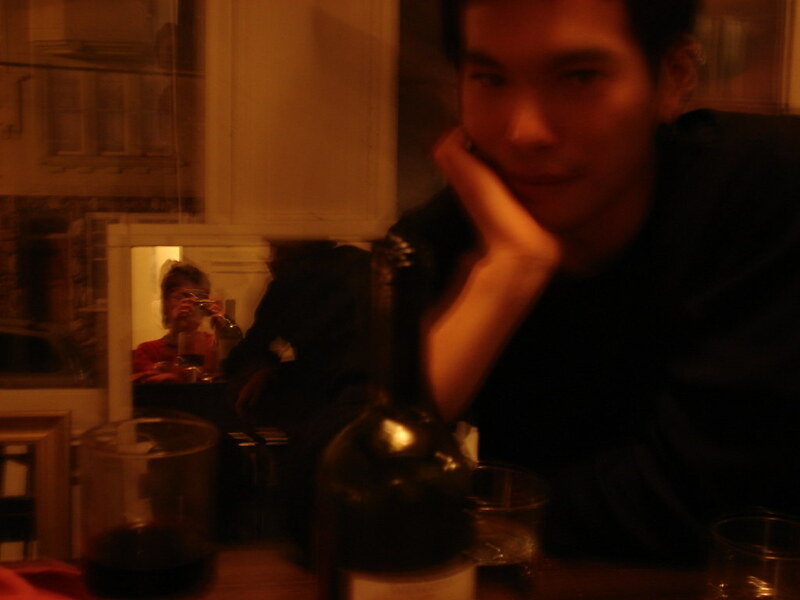 He's French, and he told me how, when his grandfather was seriously ill recently, he went to visit him in a French hospital, where the standards made British hospitals look frighteningly archaic. The standard of hygiene over there is exceptionally high, as is the nursing care. Apparently there is no such thing as M.R.S.A over there, the hospital superbug that is ravaging our British hospitals. This story that I read in The Mail, though of course designed to throw a hefty punch at the Labour government, is not unusual. It seems like it could be a somewhat sensational horror story, perhaps a terrible one-off, a tragic mistake. However, when my mother was in Chester Countess Hospital, at least five women in her ward of eight had contracted M.R.S.A, at least one of whom I know to have died. And they left my Mum in that same infected ward for two days, saying there was nowhere else to put her, and then, in the end, telling us that in fact it was, perversely, the safest place for her to be, because everywhere else they could have moved her to was in fact even more risky, with an even higher count of the superbug. This story of Eileen Scott does not shock me, the elderly woman in question contracting and finally killed by two strains of a superbug from a non-life threatening complaint for which she was admitted into hospital. Further, she was left in her own excrement for days, regularly not fed because the nurses were too busy, and was only admitted to hospital the second time because of a shoulder fracture which she suffered when two nurses tried to move her. I remember the shocking treatment my Mum got in the Chester Countess Hospital, how run off their feet the nurses were, how little thought and care was put into my mother's healthcare and comfort. It was diabolical. If we hadn't been going in every day, and then my sister continuing to go in every day after my other sister and I had left, to attend to Mum' basic needs, I shudder to think of the state she would have been left in. It was one of the worst aspects of Mum being so poorly, knowing how badly she was being looked after, how dangerous thew hospital was in terms of M.R.S.A., other superbugs and general misconduct (Mum's pneumonia was probably caused through a nurse accidently knocking out her drip). And yet, both patients and their families at such a time are rarely in the position or state to be strongly challenging the hospital management, and even if they did, wouldn't be likely to get far through the red tape. 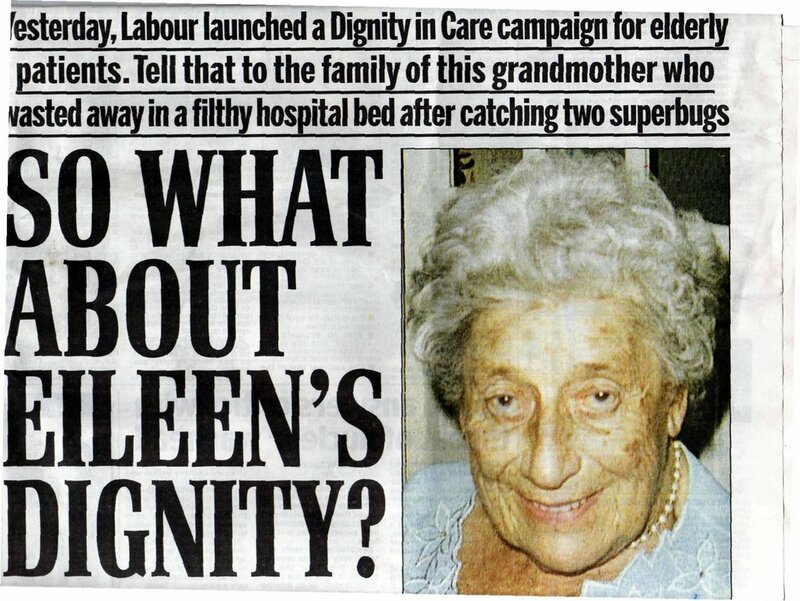 So the Government are launching a campaign of 'Dignity In care' for elderly patients in hospitals and in care homes. 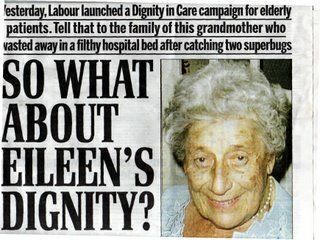 If the Government want to implement 'dignity in care', I think perhaps not forcing sick elderly patients to sell their own homes in order to fund time in care homes might be a start. My mother was lucky, she was deemed part of a process of 'continuing care' from the hospital, and her Nursing Home was funded. But it was only by the skin of our teeth that we got that, and I know how horrendous it would have been to see my mother's home, our home, forced to be sold, and my sister made homeless because of it, all to keep my Mum in a state which the Government and law deems 'living'. Thousands of other elderly patients are forced every day into such a situation. There is very little respect or understanding of the elderly in our culture today, as I think there is little understanding of the deeper issues around what it means and what it takes to give dignity and choice to the 'living'. Perhaps as well as throwing a bit of money at the NHS and care home funding, the Government would do well to invest in more deep medical, and yes, I'd say spiritual or psychological investigation into what it means to be alive as opposed to just medically 'living', how it feels to be suffering from disease or illness, or to be facing death, how it feels actually being elderly. From what I have seen, the elderly, especially the sick or disabled, are largely patronised or forgotten, pushed away out of sight, often their choices and dignity taken away from them. Ours is a superficial understanding of what it means to age, and what it means to get sick, what it means to live and what it means to die. As usual it is not just money that continuing health care for old people needs, but education, awareness, and yes, humanity. We will all be there one day, if we make it. Let's hope this new campaign shows some of that, but I won't hold my breath. Oh, yeah. A friend from high school, Magalie Royer, once told me how her English grandmother moved to France just so that she didn't have to give birth in an English hospital. But then again, the German hospital system makes the French system look archaic. On the other hand, the one in the US feels like a third world hospital. Two political posts in a row! Ta, you. I done it, she's been hearing from me. And Clare, by now and after some health issues, I start to feel how it might be to be old(er, anyway ;)) and yes, health and independency is one of the things we have to take care.